We are on the exiting end of the warmer temperatures for all of the Southeast. We will see a chance of some scattered showers on Wednesday and Wednesday evening. This front will be bringing in the first batch of much colder air to the Southeast. The recent warmth will give way to much colder temperatures over the next two weeks at least. We are watching an Alberta Clipper that may over-perform early next week and if it does, we will see many areas of the Deep South have a chance of some light snow. This is just something that we are watching at this time but discuss more about the possibilities in the member email update. The weather model data shows the very real possibility that we see a -NAO pattern setup real soon. We have been watching and waiting for this to occur and hopefully this time it will. Even if the -NAO is delayed or absent, the west coast ridge (+PNA) will once again show up and stretch into the Alaska region(-EPO). The +PNA and -EPO is enough to promote a real pattern change and one that is much colder and stormier across the Southeast and East United States. The February through March time frame is when the storm track is normally at the lowest latitude and thus why we see more winter storms in the East US during this time. 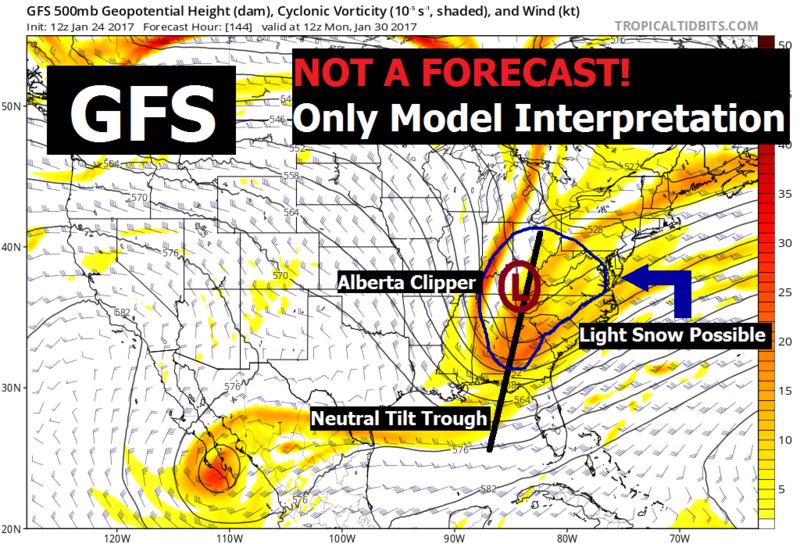 We will keep an eye on this system for early next week and will let our members know before it is published on any social media, if there will be something bigger out of this system.